In recognition of Black History Month, John Jay Homestead State Historic Site will be offering special thematic tours that examine the history of slavery in New York and in the Jay Family. The story of the Jay family, their slaves, and the way the generations of the Jays acted in response to slavery is complex. The glimpses into the past that these stories give can be a springboard toward developing a deeper understanding of the people who are part of the story. Admission: $10 for adults; $7 for seniors and students, children under 12 and members of Friends of John Jay Homestead are admitted for free. John Jay’s son William became one of America’s most important abolitionists. 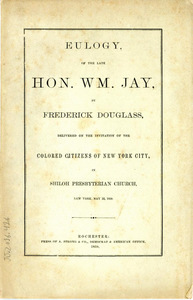 A year after his death in 1858, his fellow abolitionist, Frederick Douglass, delivered this twenty-four page eulogy to honor him.